We are now renting an incense set to make your stay comfortable and enjoyable in your room. Please ask the details to the reception. We are having Tea Ceremony in our Lobby regularly. It is open to anyone so please feel free to join!! Whad this many people came to join our last tea ceremony!! Last Monday, the 16th of AUGUST, there were Daimonji held in Kyoto. We had many guests at rooftop of our Ryokan to see the Daimonji. Kyoto is very hot everyday! Cicadas are making noises everywhere in streets. It really feels the mid of summer!! Coming August 16th, there will be a five giant bonfires lit on mountains surrounding Kyoto. It is called "Gozan no Okuribi" the festival held annually from long time ago. During the mid summer, it is said the spirits of deceased family members visit this world. It is called the O-bon and the dates are different in different regions in Japan. The fire is lit to send them back to the spiritual world. 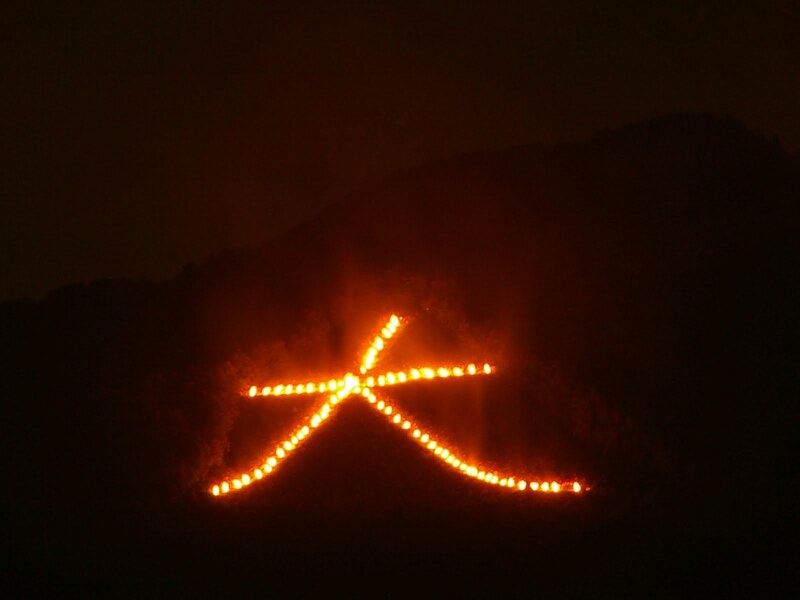 -Daimonji (大文字), the character meaning "large" or "great:"
-Hidari Daimonji (左大文字), again, the character meaning "large:"
It will be lighted up in this order and it is very spectacular to see. There will be Free english guide in the night of Daimonji. Little explanation made before fires lit in the Lobby, then we will open our rooftop for our guests staying in the ryokan that night. You can see "Daimonji", "Funagata" and "Hou" from the rooftop of our Ryokan. The Tea ceremony event is open to people not staying in our Ryokan, but this is ONLY for people stayin in our Ryokan.